In this case, I'm installing a Blackvue single-channel dashcam. These instructions will work with any dashcam or radar detector that draws 12V power. If you have a device with 5V power or anything other than 12V, you will need some kind of transformer that's widely available from online vendors like Amazon to convert 12V to whatever your device needs. I started out by attempting to remove the plastic housing the covers the base of the rearview mirror because my plan was to tap into a harness underneath. After all this product is called a "mirrortap". 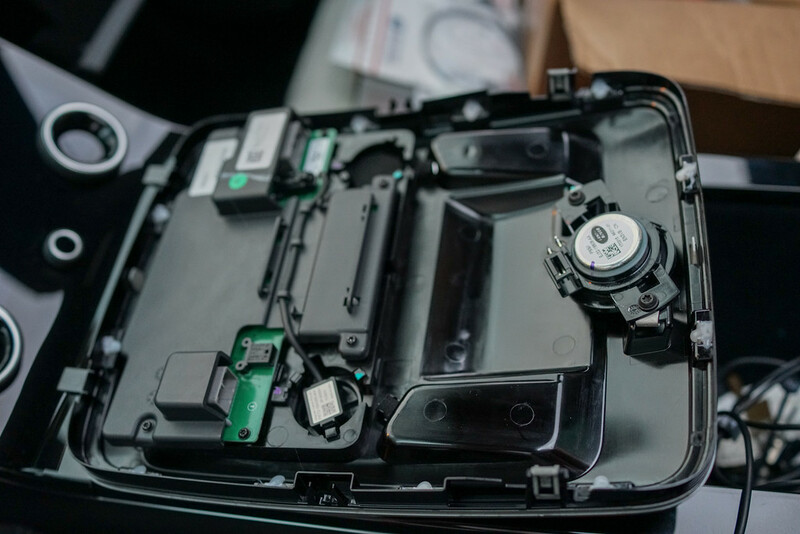 However, removing this piece proved to be a pain so abandoned this plan, therefore ignore the picture below showing me removing the plastic housing with a read nylon pry tool, and proceed to Step 1 where I'm using a blue nylon pry tool. Step 1: Remove the overhead console. Use your chosen pry tool and insert in the area as shown. You will actually be inserting the leading edge of the tool more vertically oriented (at a right angle to the roof) unlike what my photo shows. Inserting at the actual angle shown in my photo will not work. Do it gently so not to tear the headline's fabric or microsuede. There are two clips that hold the rear portion of the overhead console (as shown in the photo in Step 2. Also shown in that photo is where the front portion of the overhead console is held by tabs that release by moving the piece rearward. 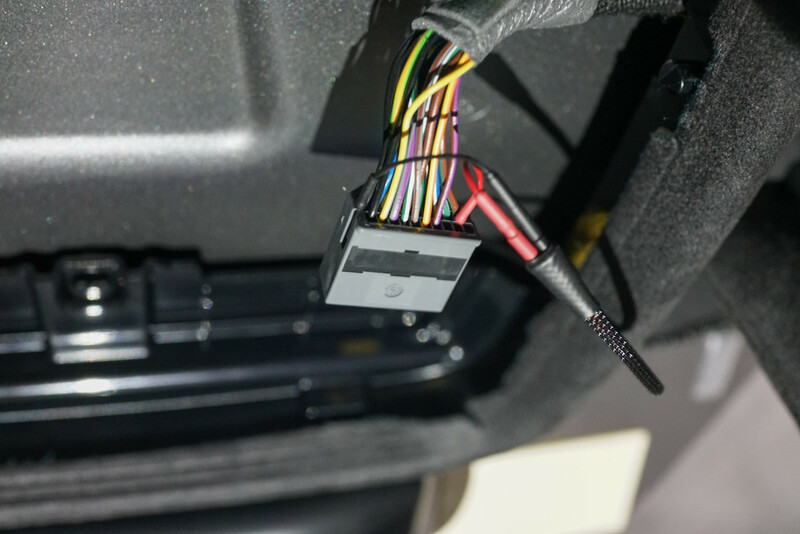 Step 3: Locate the larger-of-the-two connector (the passenger side one in the case of US-spec LHD cars). 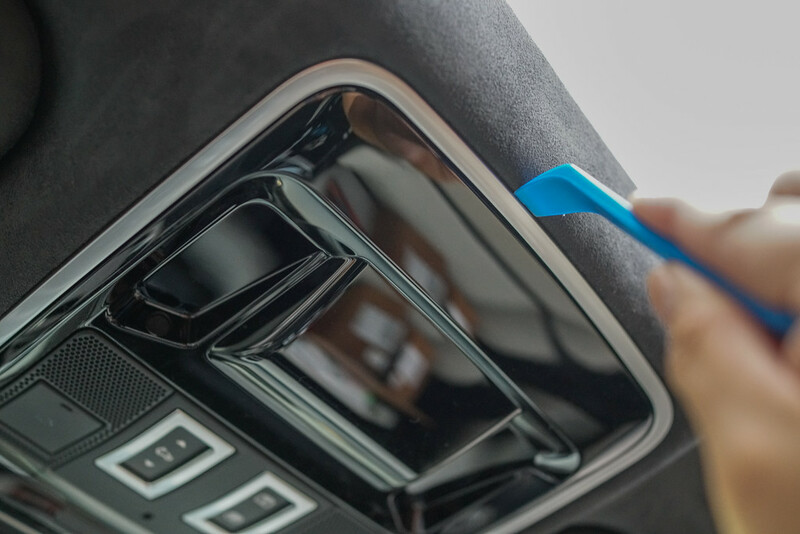 Note that the amount and location of connectors may vary depending on what trim and options your Velar has. 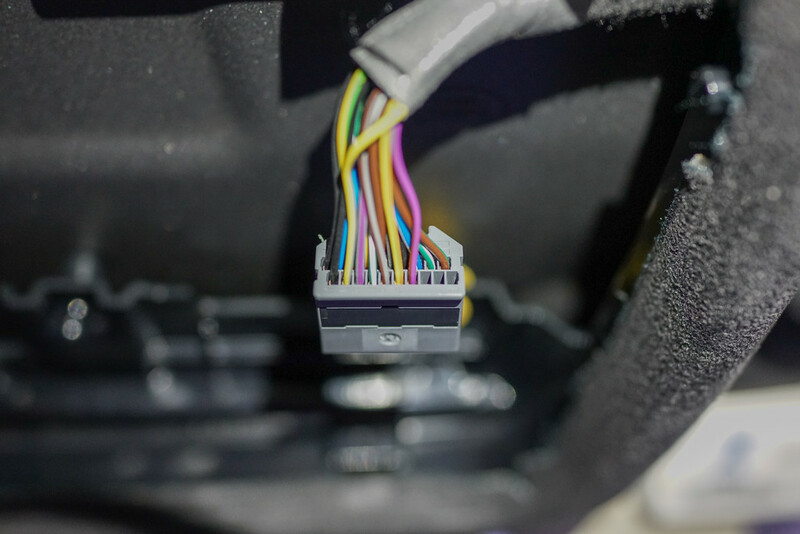 Also note that the color scheme of the wiring within the harness may vary from car to car to. These photos taken are from a Velar First Edition. Using the passenger-side connector, my plan is to use the MirrorTap spades to insert into the entry point for a ground wire and a accessory-powered 12V source. I used a multimeter to confirm that I've chosen the right ones. In my Velar, the ground turned out to be the black wire inserted into the left-most of the top row and the accessory power turned out to be the green/brown wire inserted into the right-most of the top row. To save you the trouble, this may very well be the same wire color scheme in your Velar, but it's always a good idea to check with a multimeter with the car powered off/locked versus door open and powered on. Usually, black wires are ground. Powered wires can vary. Step 4: Run your MirrorTap or applicable other-namebrand power cord through the opening as shown below and have it exit the small opening at the front edge of the fabric/microsuede roof panel where it meets the front windshield. This may prove difficult if you have fat finger like I have. 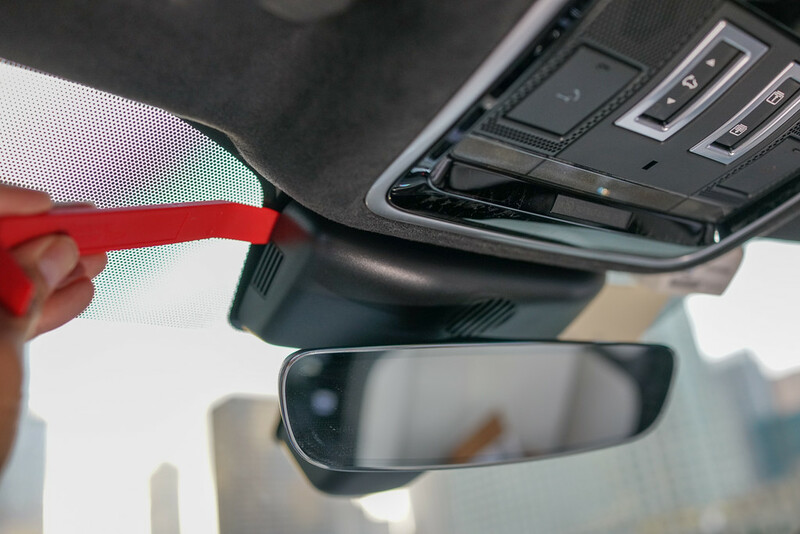 Obviously, the termination that connects to the dashcam or radar goes through and outside the roof panel and the termination with the taps stay inside. This is the MirrorTap branded power cord model I chose for my application. I bought it from Amazon like the rest of the items used in this post. This one not only works for Blackvue dashcams but also for some Cobra and Whistler radar detectors. MirrorTap and RadarMount make similar type power cords that comes in different lengths and terminations. For V1 Radar other brands of radar detectors, you will need an RJ-11 type connector termination instead of a DC plug type that I have. Step 5: Gently insert the taps into the chosen slots in the harness connector from Step 3. Again, I inserted the black (ground) tap into the black ground wire slot (leftmost top row) and I inserted the red (power) tap into the brown/green wire slot (rightmost top row). Use smaller taps if possible. I tried using .060" taps initially but were too big and I didn't want to force it and damage something, so the .040" taps worked well in my case. Nice thing about these MirrorTap and RadarMount branded power cords is that they have an inline fuse built-in for added protection. You also might want to secure the power cord and harness with some zip-ties, electrical tape, or whatever you have so that nothing comes apart if you apply some tension from the other end of the cord outside. Step 6: Put the overhead console back together. Slide in the tabs in at the front, plug-in both harness connectors to their respective sockets in the overhead console assembly, and snap the rear portion back portion so the clips engage. 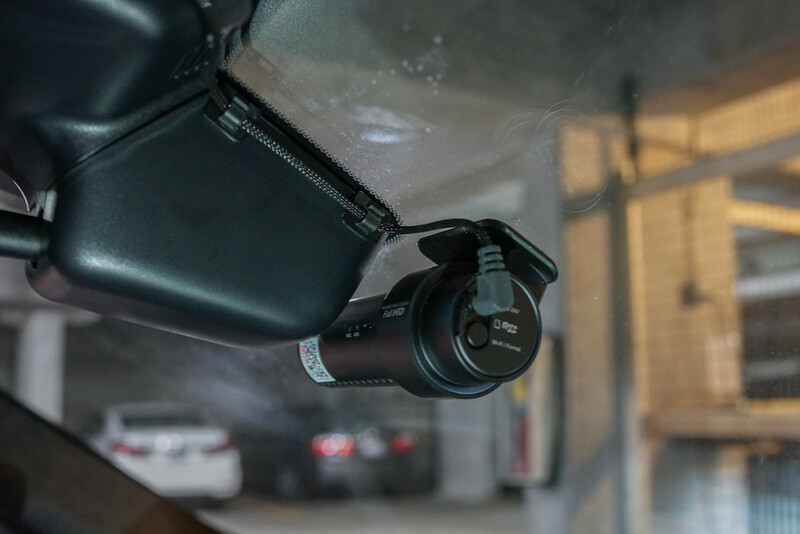 Mount your dashcam or radar detector where you want it, and hopefully you have chosen a long enough power cord to reach your device, and plug it in. You can also tidy up the install by using cable-management adhesive clips as shown here. These were actually supplied by Blackvue packaged in the box with the dashcam. Done! Celebrate that you've completed the task without breaking anything and enjoy that beer. Hopefully, it's still cold by the time you've finished and this hasn't taken you over an hour. In my case, the dashcam powers on as soon as I unlock and open the door and powers off as soon as I lock the car. This literally took me only 20 minutes, and I was being careful. 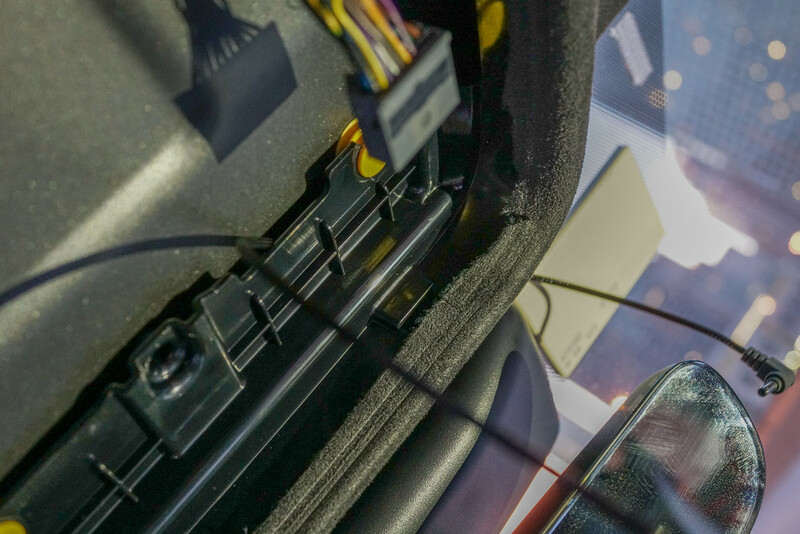 Granted I've done this before in my Audis, and unsurprisingly, the install in those cars were nearly identical with exception of accessing the harness connector power from the plastic housing of the rearview mirror instead of the overhead console in the Velar. Going to see how this hooks up in my 2017 full size. I have the new Blackvue dual channel camera. Wonder how it will power it? Install should be very similar if not the same. 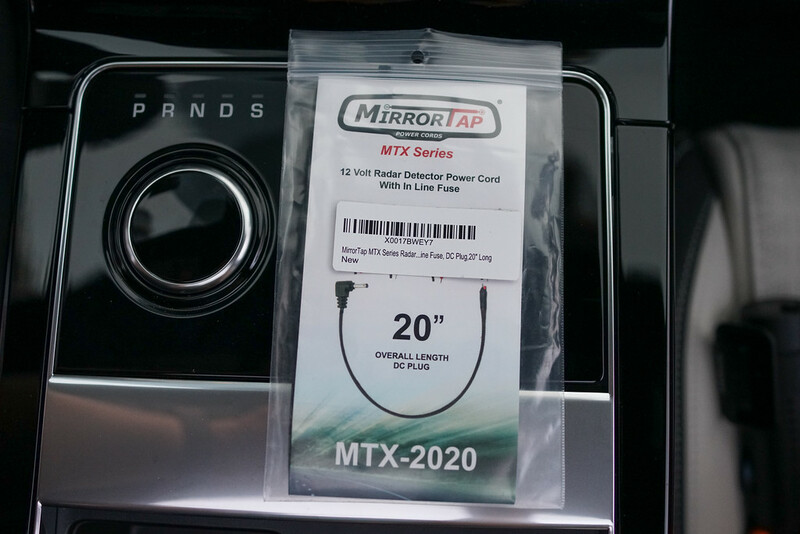 I installed a V1 radar detector via MirrorTap and BlendMount products on a friend's '16 sport and the wiring was nearly identical to my Velar. I can't imagine the full size being all that different. Just have a multimeter tool in hand to confirm it for yourself. Removal of the overhead console should be the same. I did it for my full size RR MY16. It was not difficult at all. Thank you for the instructions - without them I would not have done it.